Axe Cop is confronted by “the Girls”. 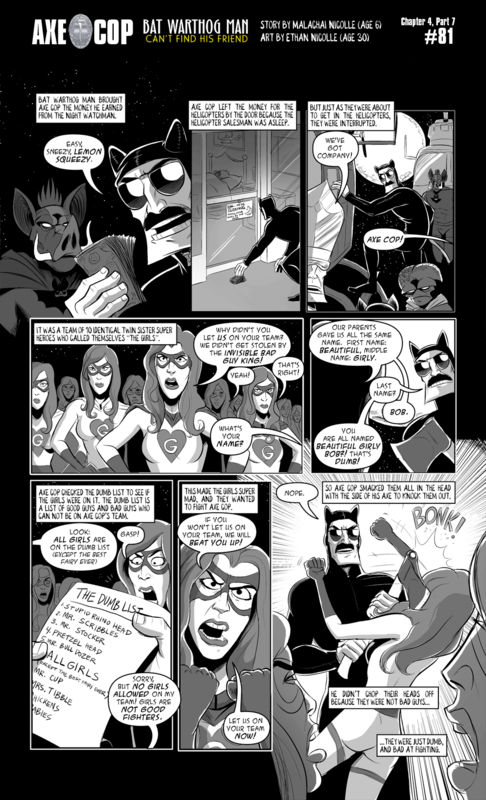 updated version: and axe girl, and water queen, and every female reader of axe cop. To be fair, it’s a 6-year old. To be even more fair, the adults around him should have corrected him and explained why this is wrong, and how it could hurt the feelings of others. That way he won’t grow up to be a sexist a-hole. If I sat and corrected and finger-wagged Malachai every time he said something that could offend the internet during the creation of Axe Cop, we would not have Axe Cop. I would have stopped him at axe. The point of axe cop was never to correct Malachai. There was a time and a place for that, mostly I let his parents make those choices. 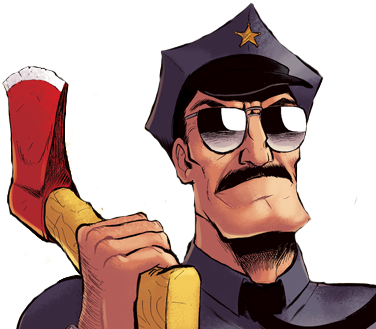 Axe Cop was always a place to freely be a 6 year old and play as one, knowing one day he would look back on it and laugh. And it is funny if you can lighten up and let him feel the way 6 year olds feel. He’s not a sexist a-hole he’s the sweetest kid you’ll ever meet. It’s written by a five-year-old. He’s probably thinking that girls are icky and dumb.